I got a call from my son, Geoffrey August Deimel, around noon yesterday. He wanted to tell me that he had just learned that one of his wines, Keuka Spring Vineyards 2012 Riesling had won the Governor’s Cup, an award for the best wine made in New York in 2012. 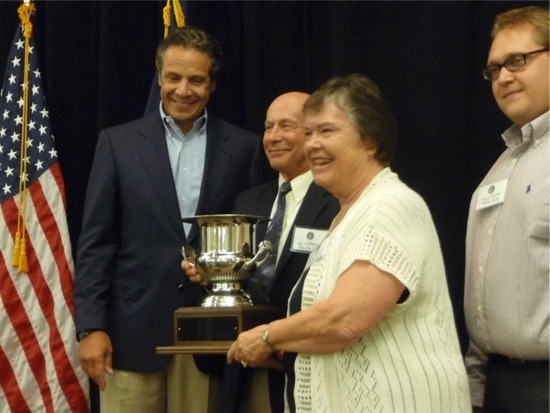 Moreover, the award was to be presented in the evening in Watkins Glen by Governor Cuomo himself. Wiltberger. Keuka Spring winemaker August Deimel is at the right. in this August 13, 2013, photo. The Keuka Spring Riesling was also declared Best White Wine, Best Medium Dry Riesling, and Best Overall Riesling. Keuka Spring wines were also given awards for Best Gewürztraminer and Best Limited Production Wine (for Keuka Spring Vineyards Dry Rosé). Details of the competition and the tour of the governor to the Finger Lakes can be found here, here, and here. The winery’s Web site is here, and its Facebook page is here. If you’re visiting the Finger Lakes, be sure to stop by the Keuka Spring Vineyards tasting room on Keuka Lake near Penn Yan, New York. Mt. Lebanon Magazine has a story about the Governor’s Cup win on its blog here.